SEA MONSTERS is a brilliantly playful and supple novel about the moments and mysteries that shape us. It takes place in 1980's Mexico City, wherein a young woman named Luisa decides to go on an adventure. Instead of going to school, she takes a bus with a boy she barely knows to the Pacific Coast in search of a mysterious group of traveling Ukranian circus performers. Mark, Sara, and Katie sat down to chat about the book. 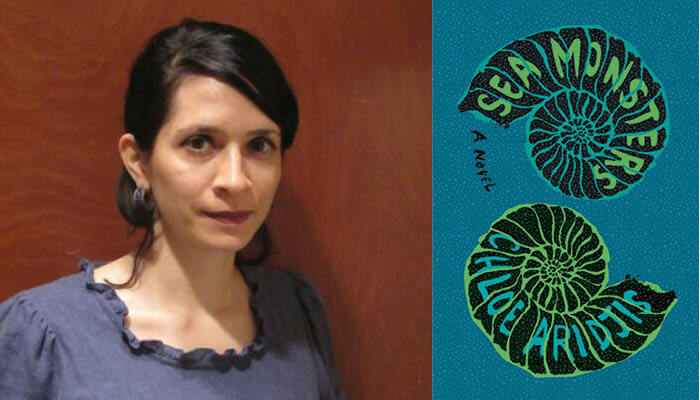 Visit us on February 25, when we host a SEA MONSTERS happy hour at 6pm and an event with Chloe Aridjis at 7pm! Mark: SEA MONSTERS is Chloe Aridjis’ third book and I think it’s her best. I’ve read her other two and I love them. The book group read her previous book, ASUNDER, when it came out. I liked it a lot. I loved BOOK OF CLOUDS. But this one has something special. It’s not just the subject matter -- you know I have an affection for Mexico -- but the writing and the story. I love this book. It’s so lyrical and so moving and profound. Katie: And the time period makes it even better I think. Mark: The book really captures childhood, and experimenting with drugs… and first relationships. Katie: Where you’re just infatuated. Mark: It reminds me a little bit of Bolano, too; there’s a danger in the book. Katie: I felt uneasy at times. Mark: When I try to describe Bolano’s books, I say there’s a sense of danger, that something bad might happen. Not in all of his work, but… that sense is so powerful. It makes this such a powerful book. Sara: I want to talk about some of these parts of the book that were so fabulous. One thing she does so well, in this passage in particular, and in a greater way, is she creates these fully fleshed-out characters. They’re not always the humans in the book, either. I think the sea is one of the biggest. It goes beyond place. It garners an identity of its own. One of my favorite parts of the way she enacts that is talking about Greek mythology and her father’s relationship to Greek mythology. He’s constantly talking about the sea at the dinner table, and talking about shipwrecks. It’s zany! And then her relationship with Baudelaire’s poetry too, in which he’s talking about Cythera, a greek goddess. It’s these relationships to other books and works of cultural epic poems and things like that that really tie the narrative into a greater cultural history of the sea as an iconic, living, breathing creature. Which is so COOL. Katie: I definitely think that her youth has to be in it. She’s so in touch with that feeling and place and sense of being. Sara: With the whole narrative, even the stuff that seems so absurd, like escaped Ukrainian dwarves -- she’s so concrete about the whole thing. It’s about the clothes she’s collecting to go on this trip. It’s about various details -- the line to the taxi station when she’s trying to get home one night. Even if it’s not the whole thing isn’t her story, she has this clarity of mental image that is so special. Mark: It’s so very concrete. You feel like you’re in Roma, or these other places she mentions. I think a lot of it’s in Roma. And the 80’s in Roma is when it would still be like in ROMA the movie. There’s a big overlap between this book and the movie, ROMA, which just came out recently. Mark: A big subject for both is childhood, and memory. The place that you come from, you know. What’s great about these, is that they’re universal but very specific. You can watch ROMA and never step foot in Mexico. Katie: It’s got that nostalgia. Mark: And in ROMA, at least, the main character is someone who many families take for granted -- the live-in housekeeper. Katie: They’re these silent people in the home who know everyone’s needs. They truly and deeply understand. They’re the constant. Mark: Another thing this ties me to is Valeria Luiselli’s book. These are both Mexican writers who wrote these books in English. I know Chloe Aridjis’ are all in English, and LOST CHILDREN ARCHIVE is Valeria Luiselli’s first in English. Sara: Both of them are about exploration in pursuit of a slightly nebulous dream. One is pursuing escaped dwarves, although it’s also so much to do with youth in general and independence, and the other is also about independence and growing up. It’s about undocumented kids at the border, and processes by which our country keeps secrets; what it allows to be secret and what it allows to be public. It’s interesting to think about how much these are -- and I hate to use this trope, but -- about human relationships. Mark: I hope that Chloe gets a bigger following with this book. I hope a lot of people read it and want to go back and read her earlier books. BOOK OF CLOUDS is also a coming-of-age book, but years later when the person is older and has gone to Europe. It feels a bit like SEA MONSTERS precedes BOOK OF CLOUDS. She’s such a great talent. Katie: Without giving anything away, going back to the question of where you come from… We follow this character, she’s a teenager, and the whole book she’s just a teen. You don’t see her as an adult or anything. When she leaves on this journey, she realizes how badly she wants to get out of the place she’s grown up. She wants change, she wants adventure, she wants what -- well, what anybody wants, but especially what you want as a teenager or young adult. She realizes that her sense of being is not really … that’s not how she’s going to find it. Self-realization plays a really big role; she thinks she has to go and do these things and live this life, but the shift really takes place inside. It doesn’t really have to do with the place. You continually have this in your life, like, ‘if I go here, it’s going to change everything,’ but that’s not always true. Sara: Were y’all like that growing up? Mark: I go home to visit Florida and I feel panicked. I think I was much older when I realized that change is so internal. But still. The relationships you have with the places you come from are very tricky. Sara: It’s so interesting to travel to different places and have a sense of these different… potential landscapes of your life, I guess? That’s what fascinates me most. Maybe that’s selfish. Being able to see yourself in different places is so cool. It’s like a thought experiment, like growing up ten times over without actually going through the moves. Mark: And giving yourself possibility to entertain other options. Even if that never happens, to deny yourself entertaining the possibilities seems such an injustice and loss. Sara: Another interesting thing about Chloe is that she just created a film, FEMALE HUMAN ANIMAL. It’s a psycho-thriller that takes place in the contemporary arts scene. Chloe is the star. She’s in a show of Leonora Carrington’s work, and a man starts following her around the show. They become deeply embroiled with each other. Very mysterious. I was trying to think of Leonora Carrington as a potential person Chloe might have been thinking about. I don’t know if she was writing the book and filming the movie at the same time, or at least had them both in her head at the same time. Mark: I’ve read Carrington’s short stories and they’re a lot like her art. Really out there. Not like ‘I’m going to try and be weird and shock you,’ but just from a really, really rich imagination. Sara: I see that touch of the impossible in Chloe’s work, though it’s so concrete. Mark: It’s funny, because I’m thinking of how to pitch this book to customers. It sounds like a comedy if you mention dwarves. It’s a lost weekend where a young girl runs away from a nice, middle-class Mexico City home with a young man and she kind of finds herself, or tries to find herself. Katie: I honestly think the dwarves play such a minor role in her decision to go. She’s just kind of like ‘I need something to make me leave.’ She’s not really thinking too much about it. I think it’s just this little tiny grain for her that sets off everything else. That’s all she needed was a little push. Mark: Such a great book.